It is so important to have the best parts to take full advantage of your Yo-Yo. Dif-e-Yo was one of the first manufacturers of Concave Bearings for all the Yo-Yos we know today. These Yo-Yo Bearings help keep the string in the middle and give you the longest spin times. 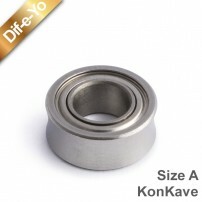 Dif-e-Yo has specialized in High Performance Bearings since then. 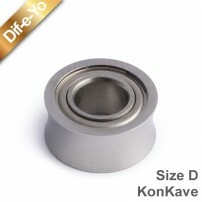 It is no surprise the best Yo-Yos come with a Dif-e-Yo bearing. Its simple, its either the best or nothing! 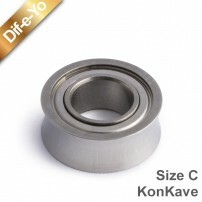 The Dif-e-Yo KonKave Stainless Bearing centers the string while at the same time allowing it to move when needed for response. Size D (5x11x5 mm.). For H-Spin. 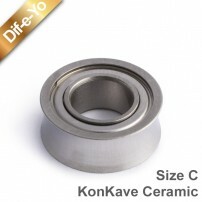 Dif-e-Yo KonKave Ceramic Size D (5x11x5 mm.) for H-Spin and SPYY.